Looking for free file sharing sites? Here are some of the best ones out there! The internet has made it extremely easy for anyone and everyone to share cloud-based files. Whether you work for a company, work as a freelancer or just want to share funny dog videos with friends, family or business associates, file sharing is something everyone’s familiar with. A recent Cloud Adoption & Risk Report found that the average employee uses three file-sharing apps at work. That’s a lot of apps for basically the same function. There are many ways to share files over the internet, thanks to the “cloud revolution”, but are they any good? Let’s take a look at some of the major free file sharing sites and how they stack up against one another. Let us kick off the list with the file sharing service by the front page of the internet, aka Google! Google Drive is Google’s cloud storage service where you can store your documents, files, audio, videos- basically anything. You can access your files stored in Google Drive from anywhere and from any device, as long as you know the login details! Google Drive offers free 15GB of cloud storage to store all your documents, spreadsheets, and media files but you can always upgrade in case you need more. Google offers quite robust and handy smartphone apps for their entire office suite so that you can work from anywhere, anytime. Google Drive’s intuitive, simple and user-friendly design makes it easy for the average user to get onboard the platform and store and share content with friends. Dropbox has been the gold standard for file sharing and storage for quite a while now. Another giant in the file-sharing space, Dropbox offers cloud storage to keep all your files in one place. It also offers desktop clients and mobile apps to keep all your files in sync and within reach. Dropbox has become a crowd favorite due to its intuitive and simple design, hassles free synchronization between desktop, cloud, and mobile, and reliable servers. Dropbox allows integration with over 100,000 third-party apps, making it a cloud storage workhorse. However, the free account starts out with a 2GB storage capacity which is way lower than what Google Drive or other services offer. Microsoft’s answer to GoogleDrive is OneDrive, a safe and secure cloud storage service. OneDrive allows users to save files and photos to OneDrive and get them from any device, anywhere. Microsoft provides secure ways to share and collaborate on content with coworkers and colleagues, both inside and outside your organization, thereby improving productivity and efficiency. OneDrive is included with Office 365 and thus, enables you to seamlessly co-author Office documents across the browser, mobile, and desktop apps. You can even make edits to your files offline and Microsoft automatically uploads the changes next time you connect. For a more professional crowd, Box is the go-to file sharing service. Box and Dropbox are often pitted against each other. A main difference between the two is the fact that Box is specially designed for businesses and the IT sector to share, edit and secure files over the cloud, while Dropbox usually caters to the consumer crowd. Box allows seamlessly transfer of data from your PC to Box cloud. You can invite teammates to collaborate, join in on any conversation, or edit files together for better results and understanding. You can control who can view, share, edit and upload files, giving you a lot of security and privacy options and send large files quickly over the cloud. The Business plan starts at $15 per user per month. It offers unlimited storage with a 5 GB limit, integration with Microsoft Office 365, and custom branding features. The free plan has 10GB of storage space and a 250MB upload limit. Apart from their enterprise-level storage solution known as AWS, Amazon also has a consumer-based cloud storage solution, previously called Amazon Cloud Drive, and now renamed Amazon Drive. Amazon Drive allows users to store all their multi-media aka photos, videos, and files to Amazon’s cloud and access it anytime and anywhere. With Android and iOS available, users can set Auto-Save to back up the photos and videos on their phone. For Amazon Prime members, Amazon Drive offers unlimited cloud photo storage and 5GB of video storage capacity. For $60, you can get the Drive’s 1TB plan, which according to market standards, is not expensive at all! All in all, Amazon Drive offers a central place for all your files at a reasonable price, making it a great file sharing tool. Hightail, formerly known as YouSendIt, is another file sharing service but catered more towards team collaboration than individual sharing. Hightail works on the premise of something they called “Spaces” which allows team members to share files like videos and images with one another and collaborate. However, for the average user, this kind of interface might be confusing. Hightail, however, makes it very easy to add files to their platform; Whether you prefer to select files, drag, and drop or import content from other services like Dropbox or Google Drive, Hightail makes it easy to upload and share your work. The free plan of Hightail is a downer, allowing only 2GB of storage space with a 100mb file limit. If you are looking for a casual tool to store and share files, Hightail might not be the tool for you. Whether you’re sharing photos, videos, audio, or docs, MediaFire can simplify your workflow. A file storage and sharing tool, Mediafire provides 10GB storage space for free and a 4GB file upload limit. After uploading your files, you can then easily share through email, link, or any social network. Every month more than 840 million people use MediaFire to send and receive files with their friends, family, fans, colleagues, and clients, making it one of the go-to tools for casual file storage and sharing. And with both Android and iOS mobile apps, Mediafire provides you a way to access your files anytime, anywhere. Bit is a new age cloud-based document collaboration and content management tool that helps teams to manage all of their content in one place. Apart from allowing teams to collaboratively create, share, store and track their documents, Bit also provides a space for teams to store all of their content- PDF, cloud files, videos, audios, spreadsheets or any other digital asset you can think of! Each team can work in a different workspace and create workplace documents. Each workspace has its own content library where anything that gets added to a document gets stored in that content library. It is a smart way to save your digital content in one central location. Citrix ShareFile is a new file storage service by digital workspace giant Citrix. Citrix file storage and sharing are especially aimed at enterprise companies wanting to share large files in the safest and secure way possible. 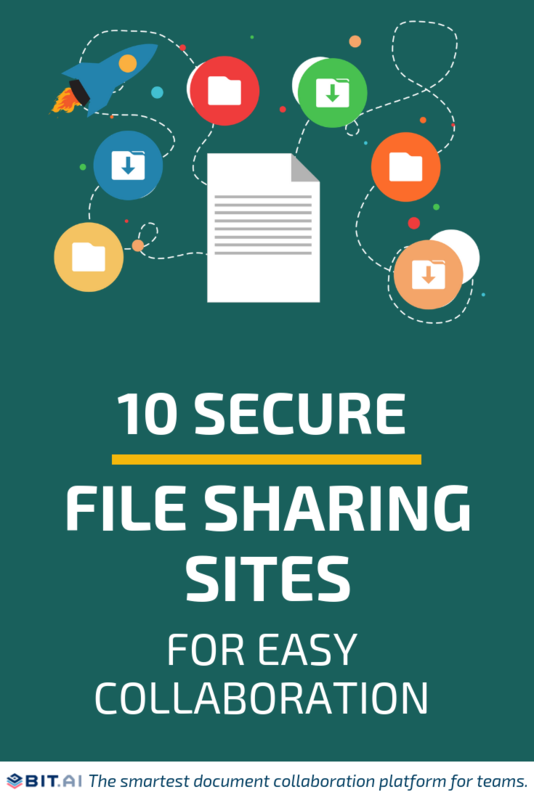 A secure managed file transfer (MFT) software, Sharefile is extremely useful for companies who need to store and share highly sensitive data and proprietary information. Starting at $16/month, Sharefile provides world-class security, password protection, intuitive interface and easy integration with third-party storage services such as Google Drive, SharePoint, Box, and Dropbox, making it one of the best MFT tools on this list. We cannot talk about free file sharing websites without mentioning Zippyshare now, can we? Zippyshare is a free file sharing website that contains no download and uploads limits. However, the catch is that you can only upload files with size up to 500MB and all files get removed from their servers after 30 days. Zippyshare offers unlimited disk space and can be accessed without forcing you to make an account. The uploaded files can be easily shared with anyone via via email, message or social media. Even though Zippyshare do not have the most visually appealing user interface, its ease of use more than makes up for it. DropSend advertises it to be “the” platform to send large files. However, by large files, DropSend means files up to 8GB in size. If you are struggling with sending files as email attachments, DropSend allows you to upload files to its server and then send a download link to the receiver via email. The files uploaded to DropSend are secured with 256 AES High-Level Encryption. With DropSend Direct, users can easily drag & drop multiple files in a quick and easy way, right from their desktop. You’ll never have to worry about interrupted uploads and slow Internet connection as the upload resumes as soon as you get re-connected to a stable network. The free plan has 4GB of storage but only 5 “shares” per month, which in reality, is not that good of a deal. So there you have, some of the best free file sharing websites on the internet right now. Sharing files from one part of the world to another seems like a dream come true, especially if you are old enough to have witnessed the olden days of USB sticks and email attachments. Now, you can free up your device’s space and upload all your files to the cloud, access them from anywhere in the world, and share them with friends and family easily. Did we miss your favorite file sharing tool? Tweet us with your suggestions @bit_docs. If you have another tool that deserves a review and a mention here send us an email.